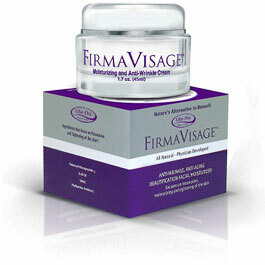 FirmaVisage – Anti-Wrinkle and Superior Moisturizer for the Face Bruising, bleeding, or even infection from medical anti-wrinkle treatments can be a serious inconvenience for those seeking firmer, younger-looking facial skin. Now there’s all-natural FirmaVisage ( Firma Visage ). This safe topical cream is clinically proven to gently and effectively reduce wrinkles and fine lines from all areas of the face and neck. The unique synergy created by the key ingredients in FirmaVisage can help decrease wrinkle volume, density, and visual appearance, while increasing the skin¹s firmness and synthesis of collagen. Plus, FirmaVisage’s superior moisturizing ingredients will leave your face softer than you thought possible. Firma Visage Features Intensive Moisturizer Anti-wrinkle, skin tightening & restorative properties Will not clog pores Anti-aging and skin softening properties Contains cutting-edge ingredients that exceed those in Strivectin-SD Firma Visage Ingredients Key ingredients that focus on restoration and tightening of the skin: Palmitoyl Pentapeptide-3 (Matrixyl) Krill Oil DMAE Phyllanthus emblica L. Key ingredients that focus on intensive moisturizing and softening of the skin: Hyaluronic Acid Siegesbeckia Orientalis Extract Shea Butter Essential oils If you’re considering a medical treatment for your facial wrinkles and fine lines, you owe it to yourself to try Life-Flo’s safe (and affordable) alternative – FirmaVisage. This entry was posted on Friday, July 6th, 2007 at 12:01 am and is filed under Skin Care. You can follow any responses to this entry through the RSS 2.0 feed. You can leave a response, or trackback from your own site.